The German company, Festo specializes in Pneumatic and Electrical automation technology. This means that their research is directed toward the mastery and optimization of efficient airflow. At this company they have ongoing research in the automation field with their Bionic Learning Network. Here they take engineers and scientists from their company along with people from other companies and universities, to do research and develop new automation and energy efficient bio mechatronic technologies. Biomechatronic technology uses light weight mechanisms in combination with electric propulsion and smart control and regulation systems powered by intelligent software to create new technologies. In this network they try to use nature as a model to adapt technologies to industrial applications, in other words they use nature as an inspiration for engineering. 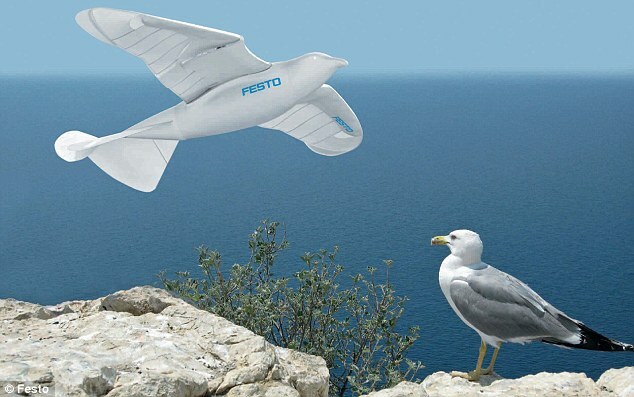 In the past Festo has come up with technologies like the AirJelly or the Airray, which have been able to fly and move through the air with the use of helium and biomechatronic systems. But their latest invention is called the SmartBird. This SmartBird uses biomechatronic systems to achieve flapping flight and take of and landings under its own power. To make this SmartBird the engineers were inspired by the Herring Gull and its wings but they had to test different wing contours, angles of inclination, and shapes to try to maximize lift and propulsion. The one they ended up using, has never existed in nature. Many people did not think it had the potential to create the lift and propulsion needed to get the bird off the ground, but then again people never thought flapping flight would be achieved either. Engineers took inspiration from the Herring Gull. The SmartBird is made up of about 130 components including lightweight wings made of carbon fiber parts, sensors, and motors. It weighs only 485 grams and has a wingspan of about 2 meters. The controller of the bird can modify the wing position due to changes in wind or airflow. This is called active wing torsion and this makes the flapping flight possible. This means that the wings can adjust their rotation in their upward and downward strokes due to environmental changes. It has a primary wing, the hand wing, which is for propulsion, and a secondary wing, or arm wing for lift. An electrical motor with a two-stage gear creates the flapping motion. The flapping and bending forces are made by a reflexible link and a crank mechanism. This crank mechanism does not have a dead center so it runs evenly and creates a smooth flight. The wingtips move separately from the wing due to a motor with sensors, so the controller knows the wing position at all times. The head and torso move in opposite directions with the help of two motors and cables that bend aerodynamically and simultaneously to counter and correct the weight displacement. This makes the SmartBird more maneuverable and agile. The tail can also move up and down and can curve to create lift and act as a rudder to steer the bird where is needs to go (Festo). The flapping motion of the SmartBird. According to its creator Marcus Fisher, this is one of the most aerodynamically efficient creations ever built in the automation field. It is about seventy to eighty percent aerodynamically effective because of the design. Another component that makes it so efficient is the smart technologies that adjust the active torsion to the changes in the wind or airflow. This optimizes the efficiency because of it adjusts in time with the changes in the environment. Some of the carbon fiber parts in the SmartBird. Fasto achieves flapping flight by mimicking the flight of seagulls. With a biomechatronic system, the engineers were able to create a highly efficient machine that can fly without a fixed wing. The two part wings create lift and propulsion and sensors monitor air conditions so the sensors can adjust the motors to the environment just like real Herring Gulls do. People for a very long time did not think flapping flight was possible, but with this new technology, who knows what engineers can do next, a plane that flies like the birds? That’s really cool. It seems pretty inefficient, though. This is awesome. I watched the TED talk, and it’s incredible how much control authority it demonstrated in this early form of development. It’s actually more efficient than a comparable airplane of that size- most model airplanes require 50 watts per pound (the bird is about a pound) to take off, while this bird requires less than 25 watts. Incredible improvement in efficiency. I think that’s pretty awesome. But it’d be even better if they could apply this to maybe something that can benefit us. I was about to write about this topic too!! I saw the presentation on TED and it was very interesting. I kind of agree with what Adrienne is saying; I feel this technology can be so much more useful if it had a more concrete application other than just to mimic a bird’s flying motion. It’ll be cool if they create some sort of spying machine later in the future than can be used in warfare. Interesting stuff!! Even if you think this invention is not “practical” or has no immediate uses that can benefit us, the process of creating it will have produced new technology that can be used in other devices. This is what usually happens with research projects, and a lot of our technology was born as part of a project like this. I like how this post goes into a lot of the technical details of how SmartBird works.